Google does many wonderful things for us like Google Search Engine which get more than 3 billion search queries per day. Google’s Gmail which is probably the best free email platform which gives you 15GB of free storage. Google Docs which includes word, excel, spreadsheet etc.. so for all these services we should thank Google and the people behind it. Android devices include builtin security features which you can use to protect your device and your personal information, including screen locks and data encryption. Android Data protection, or Factory Reset Protection (FRP), is a security feature on Android devices with Lollipop 5.1 and higher. Samsung FRP factory reset protection or Android FRP is activated by default automatically when you set up a Google Account on your smart phone or tablet. Once FRP is activated, it prevents use of a device after a factory data reset, until you log in using a Google username and password previously set up on the device. 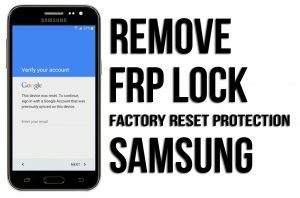 How Does FRP (Factory Reset Protection) Work. How Much Does it Cost to Remove FRP (Factory Reset Protection). Gadget Fix Australia can remove your Samsung FRP (factory reset protection, factory data protection) for $99 AUD. We are in Melbourne however we can expertly service all other states including New South Wales, Queensland, South Australia, Western Australia, Tasmania with our mail in service. For our Melbourne based customers we can remove FRP in 5 minutes in most cases however sometimes it can also take up to an hour. FRP Google Lock Removal $99 Only.